For organizations that have multiple campuses, each with multiple facilities on them, you may decide to use Locations to describe the campus. Then you can use Bldg./Units to describe the structures on each campus. *Note: There are user roles in Incident that can be restricted to the Location level, but not the Bldg./Unit level. 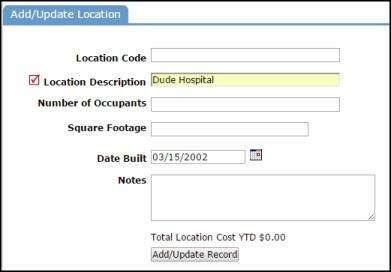 The Location list is automatically populated if other Dude Solutions applications are in use by your organization. Locations with a yellow thumbs-up ( ) are active and ready for use within the application. Locations with a gray thumbs-down ( ) are inactive in the account and unavailable for use in the application. To activate a Location, click on the icon.